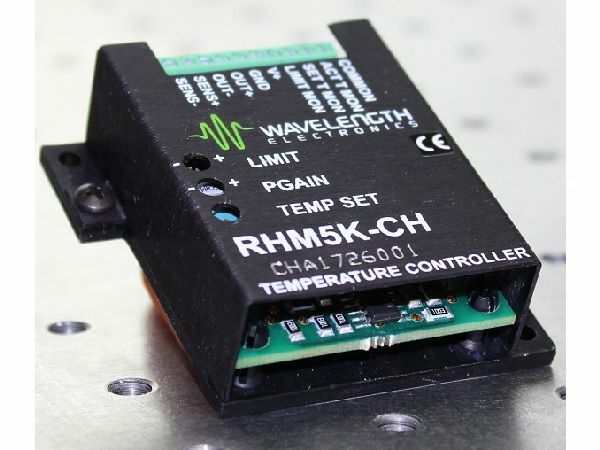 The RHM5K-CH is a 5 Amp precision temperature controller in a small, chassis mount package. A linear unipolar output stage can be configured for off-ambient control in heating or cooling applications. Small package: 2.1" x 2.1" x 0.8"
The RHM temperature controller interfaces with virtually any type of temperature sensor. An onboard sensor bias current source can drive thermistors, RTDs, or the LM335. For sensors like the AD590, simply bias it and drive it into the sensor input. A trimpot adjusts the Proportional Gain (P). Fixed Integrator Time Constant (I) and Differential Term capacitors can be custom fit to your application to optimize temperature overshoot and stability. Another trimpot adjusts the setpoint temperature. Up to 27 V can be delivered to the load with 30 V input. Heatsinking then becomes critical and a Safe Operating Area tool is available to make sure you don’t exceed the maximum internal power dissipation of the package. Monitor pins bring out both Setpoint and Actual temperature signals. Current limit is set via a third potentiometer. This product is ideal for applications where temperature stability is critical and space is tight, such as heated optics (non-condensing circumstances), CCDs, preheated liquids and chamber stabilization.